It’s no surprise to any of us that toys are expensive. It’s always shocking to see the latest price tag on the newest toy and wonder how so many parents out there can afford it. Think about the huge amount of toys that line the shelves at the store, just waiting for your child to play with it. As a parent, we know the struggle is all too real when it comes to the battle of saying “no” to those expensive toys that our children want. But can you blame them? Those toys with a high price tag are pushed everywhere! Ads, magazines, radio, billboards…you name it. And the closer that we get to the holiday season, the worse it becomes. It can be frustrating, to say the least…but, the good news is that there are some great toys out there that won’t break the bank! Looking for a few options that fall under that $15/$20 price point? You’re in luck! Helicopter Drone. What child wouldn’t love to have this LED helicopter drone? It flies, it lights up and is sure to provide hours of fun for your little one. And while drones are typically pretty high-priced, this little gem of a find is a nice treat in price. Ditto Mini Robot. This little robot is perfect for little boys and girls. With a simple press of a button you can record their tiny voices and then have fun changing them up. Click-A-Brick Animal Kingdom. Have a little one that likes to build and create? This toy is the one that you need. Say goodbye to those tiny legos and welcome these larger building blocks to your child. Not only are they great with creativity, they also help with hand-eye coordination and fine motor skills. Nerf Super Soaker. Speaking of summertime fun, what child can deny the silliness of these fun toys? Beware, if you step outside you’ll likely get soaked as well! Frisbee Rings. If your little one has a bit of difficulty throwing the regular frisbee, these frisbee rings are awesome! Not only are they lighter and easier to hold, it gets them out and about to exercise and move their body. Fun and healthy? Yes, please! Pretend Play Purse. Does the princess in your life love imitating Mama by carrying around a purse? Look no further than this adorable toy. Pair this with some fun dress-up heels, and they’ll be ready for a fantastic play date for sure! Hoverball. Talk about an inventive and fun toy. Not only does this get your little ones up and running around and moving, but it’s made to literally glide over any type of surface as well. Your child can play with it indoors (careful!) or test their skills outside also! That’s the beauty of toys…there are always so many to choose from that it’s hard not to find one that fits your price point and the needs and wants of your child. Keep in mind that if you are able to find a toy that offers the ability for your child to be outside and moving around while also having fun, that’s the best of both worlds! Outdoors toys are the best for summer! Let them enjoy that warm summer air, and run around for hours playing and getting some great exercise. And if that weather turns a little less than stellar? Don’t forget about the power of board games and cards. There are a ton of great options out there that are made for children specifically and are not only fun but educational as well. Have fun searching for the best toy for your child and see if any of the suggested items above are a match for what you are looking for. And remember that not all awesome and fun toys have to be super expensive! 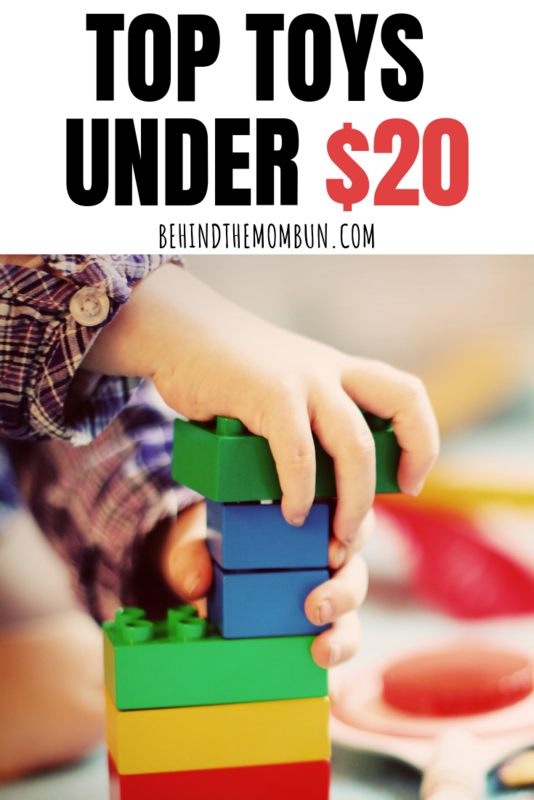 The post Top Kid Toys for Under $20 appeared first on Behind the Mom Bun.